Extended wear of fluid-filled scleral contact lenses may change cornea nerve function in patients with certain diseases, according to research in the April 2015 Cornea. Age has no significant difference on visual acuity in the presence of defocus and astigmatic blur, reports a study in the March 2015 Optometry and Vision Science. Corneal crosslinking may reduce length and severity of treatment in patients with moderate bacterial keratitis, according to research in the April 2015 Cornea. Use of certain antibiotics should strongly be considered to help prevent secondary corneal infections in patients wearing therapeutic soft contact lenses, says research in the March 2015 Eye & Contact Lens. A single dose of certain artificial tears may have a beneficial effect on the tear film thickness (TFT) of dry eye patients, reports a study in the April 2015 Cornea. In a randomized, double-masked controlled parallel group study, patients received a single dose of either unpreserved trehalose 30 mg/mL and sodium hyaluronate 1.5 mg/mL (TH-SH); unpreserved sodium hyaluronate, 0.15% (HA); or sodium chloride, 0.9% (NaCl) eye drops. Ten minutes after instillation, researchers observed an increase in TFT of the TH-SH group and the HA group, whereas no significant change was observed in the NaCl group. Interestingly, the increase in TFT remained statistically significant up to 240 minutes following instillation in the TH-SH group, but only 10, 20 and 40 minutes following instillation in the HA group, suggesting longer corneal residence of the TH-containing eye drops. Check out more articles from the April issue of RCCL here! With over 30 million contact lens wearers in the US alone, some issues—either from noncompliance to wear and care guidelines, or simply bad luck—are inevitable. But, they present far too often in many practices. 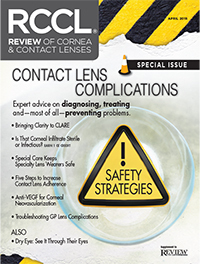 To help, the April Review of Cornea & Contact Lenses is devoted to improving your understanding of contact lens complications. Below are 20 great pearls shared by experts in the field. For more detail, click through to read the original articles for each.